The hunt is always on with Brandon Graham. His attention to detail and subtlety can lend to those small joys of finding little secrets. His unique brand of architecture, machines, and humanoids found in Multiple Warheads helps to recognise some of the elements of this cover. The underwater section has some disturbing scenes of crashed airplanes, tanks and lost relics. The disemboweled diver to the lower right gives the impression of a toxic environment but also a dangerous terror. Though the more you look at it, you may wonder whether he or she was a victim of a crash or war. I quite like the march of mutated fish, each with their own name, led by their king called Kanx with a little crown. The Island is quite far into the distance but Graham has placed quite exquisite details into its design. You can see commercial buildings with a rocket ship at the apex and a port at the base. The right side of the island is quite futuristic with an industrial feel to it whereas the left is very much more rural and medieval. There are hills and stone walls which look like animals and a head peering outwards. Its quite a dichotomy but the meaning behind it is anyone’s guess but once again, Multiple Warheads is also exactly that. 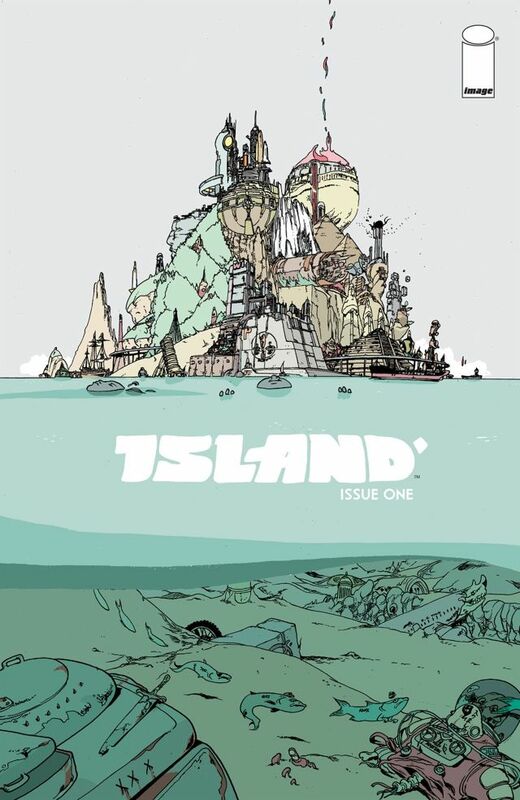 The colouring of the page adds to the underwater feel and the picturesque postcard picture that is Island. Previous PostThe Theatre List 8/7 – Image winning Secret Wars!